Now a coupla real ales; Doom Bar and Otter on my visit, so unexciting but the latter tasted fine. In a rather posh area, this pub doesn't quite hit the mark in decor, atmosphere. Better than a chain though. Is there no real ale? I didn't see any certainly. Laksa was good if expensive, and therein lies the rub - it bills itself more as a restaurant than a pub. Not too busy at least not indoors. The website is nicelooking but an example of Pointless Flash - which says a lot about the pub really. Could be a pretty decent pub, but the only bitter they had on was John Smith�s keg. The absence of any real ale means I won�t be going back. 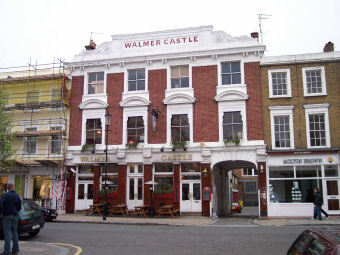 My wife and I use to enjoy going to the Walmer Castle, there is no doubt that the food is great. But last night I went along with a large group and the service was shocking. The head waitress (dragon lady) was forcing people to take the set menu. When people objected, each for their own reasons, she became irate and extremely unfriendly. This is simply not good enough. It is such a shame to see another restaurant in London go this way. Avoid large groups I guess. Turned up for lunch with 8 people,no booking, saturday afternoon. Food fantastic, service good and the beer plentiful. All in all thumbs up.